Utilize free credit reports and spending tactics to get out of bad credit. Not everyone starts out with a good credit score when they're in the market for a new purchase or loan, but there are many ways to repair bad credit to earn the best score possible. If you want to get a credit card with a low interest rate, buy a house, refinance a loan or buy a car, you need to have an excellent credit score. It can take years to repair bad credit, but the lower interest rates that a good score makes possible can save you thousands of dollars a year. The first step to fixing your credit score is knowing exactly what is contained in your official credit history. It is free in all 50 states to get a credit report from all three of the credit bureaus, and in some states you can get them for free more often. All three are necessary because there may be accounts that are only reported to one or two of the agencies. It is also possible to have a mistake in one of the reports, and that mistake may greatly affect your credit score. Take note of all of the accounts that are contained in your reports. Any late payments that are in the past will affect your score, but there is little that you can do about them other than paying your bills on time and avoiding any more late payments. 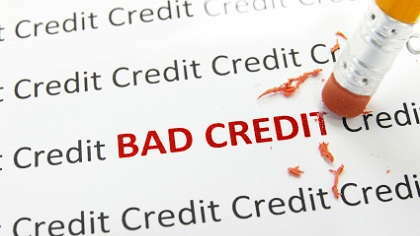 The biggest opportunities to repair bad credit are to pay off accounts that are late. Accounts that are more than 30 days late should be paid as soon as possible. If you don't have the money to pay them off completely, call the companies and arrange a payment plan. This will keep the bill out of collections' hands if it hasn't already been sent to a collections agency. If it has been, negotiate with the collections company to get the bill paid off and off your credit report as an account that is currently past due. If you already have a credit card, continue using it. Using credit and paying it off on time each month will help to strengthen your credit rating. However, avoid using too much of the available credit on the card. The ratio of available credit to the credit actually being used is an important factor in your credit rating. If you use too much, it shows credit agencies that you may not be able to take on more debt and pay it on time. If you don't have a credit card because of bad credit, consider a secured card. These are offered to people with poor credit because they are secured by an initial deposit. The card often begins with a credit line equal to the deposit and grows from there as good payment habits continue over time. This can help to build your credit rating back up as you continue to pay off your existing debt. Though these fixes take time, being able to repair bad credit is an important way to get back on your financial feet.